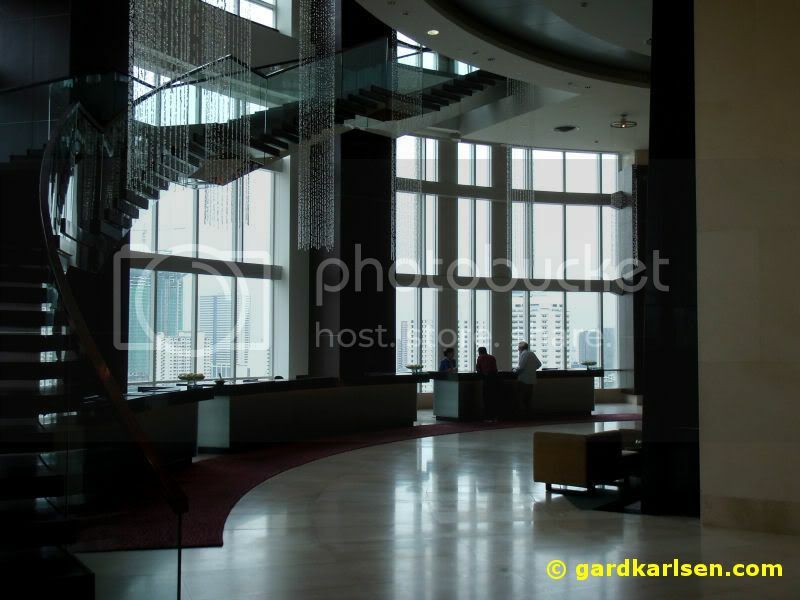 I stayed at Centara Grand at CentralWorld in the beginning of December 2008. I booked the hotel via the internet and it was 4000 THB per night. As I booked it via the internet I also got the promotion of either getting a room upgrade or getting access to the lounge on the executive level. For reference: I have been to Bangkok a number of times before and I have stayed at places like Lebua at State tower, Sheraton Grande Sukhumvit, Rembrandt, Majestic, Dusit Thani etc. Here is a trip report that I made from Bangkok when we went there in 2007. 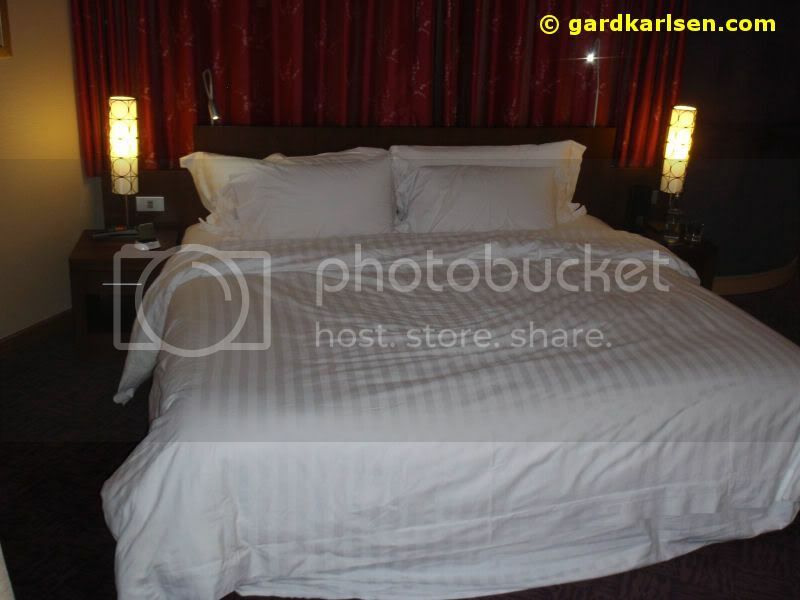 I think Centara Grand must be fairly new – the taxi driver did not seem to have any idea about the hotel but as we could tell him that it was located in the Central World complex it was not a problem. The taxi from the airport was 250 Bath + toll charges of about 70 Bath. 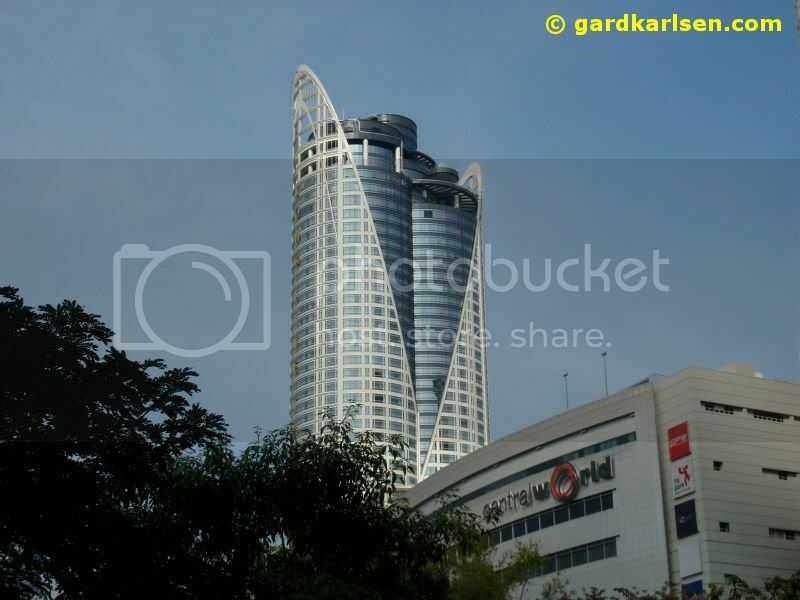 When we arrived at the hotel we came to an impressive façade at the back of the Central World Place. At the moment we pulled in we were taken care of by the hotel staff and they organized the bag drop for us and showed us to the lobby located on the 23rd floor. The lobby is beautiful with water running down the walls in a modern kind of fountain set up, modern and light chandeliers hanging from the ceiling etc. The check-in was fast and I got room 3906 on the 39th floor. 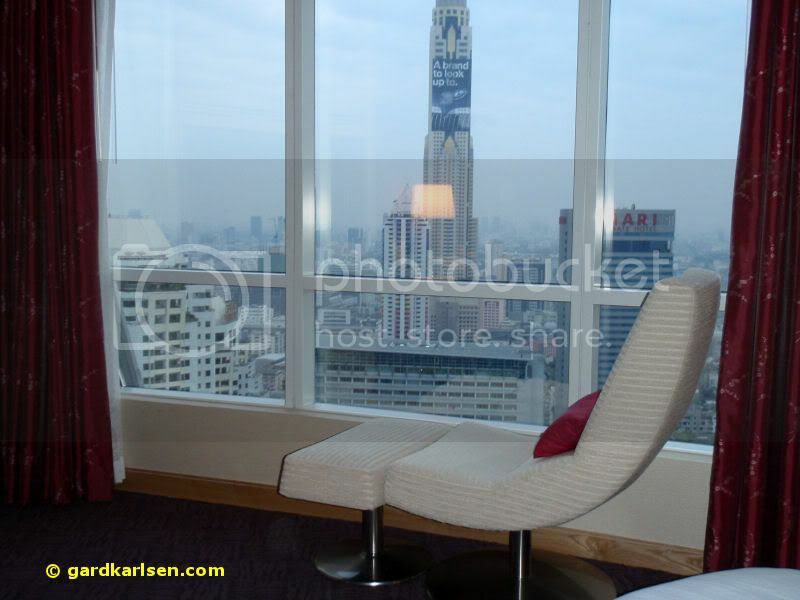 The room I got was a mid-section room and facing the Baiyoke Tower. My first impression of the hotel room was very good. First of all it seemed pretty new and built in a modern style. The walls are in light wood and light wall paper – apart from a few patches in red and purple. The purple colour theme is also reflected in the dark carpet. 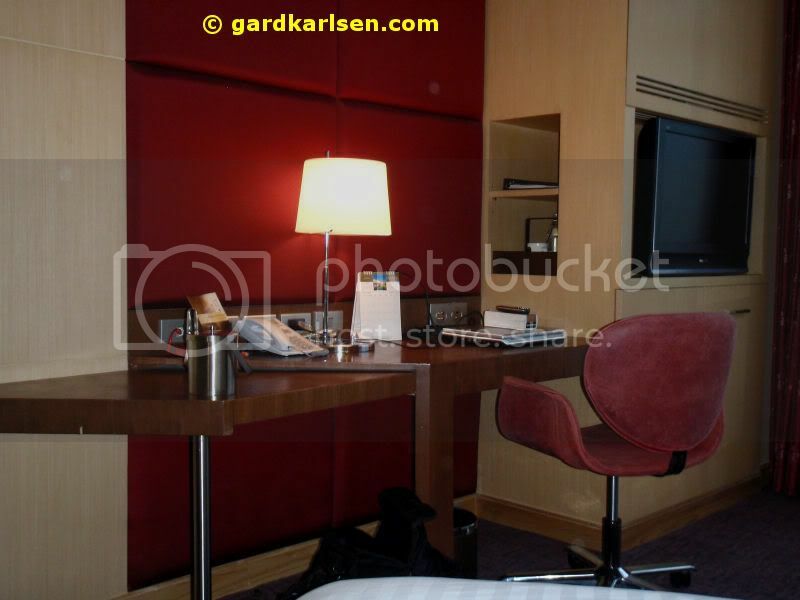 The bed was (as always) huge and setup in an angle in the room. The only problem was that the bed was pretty hard so it was not that comfortable. The work desk was pretty clever as I could adjust the size of it according to my need. There were also outlets from plugging in the laptop and wired internet – but unfortunately the internet was not free. The TV setup was also quite clever – a Panasonic Viera flat screen TV was mounted in one of the pieces of furniture. The clever part was that it was mounted on an arm so you could either watch it from the chair in the room or adjust it to allow TV viewing from the bed. As it is not recommended to drink the tap water, the hotel room was filled with lots of glass bottles of drinking water. The safe was located in small compartment in the wardrobe so I didn’t see it at first. It was more or less on floor level so the placement was not ideal. I could not find an iron or ironing board in the room but I guess you can call for it. The bathroom was also very nice. 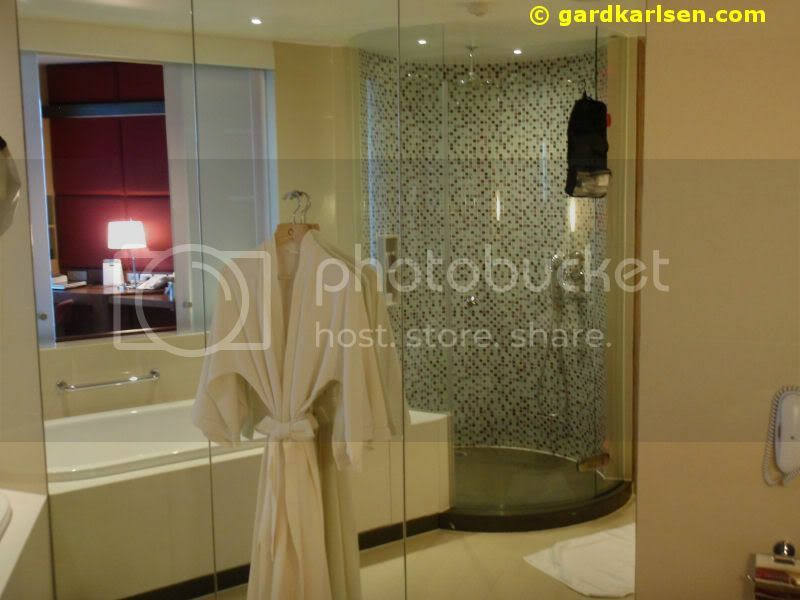 Lots of light tiles, lots of mirrors, a regular bathtub and a HUGE glass shower area with room for at least 2 people. There was also a window between the bathroom and the bedroom and with small sliding doors you could even open this. It was even possible to watch the TV from the shower due to all the mirrors. The bathroom door was also a frosted sliding door. 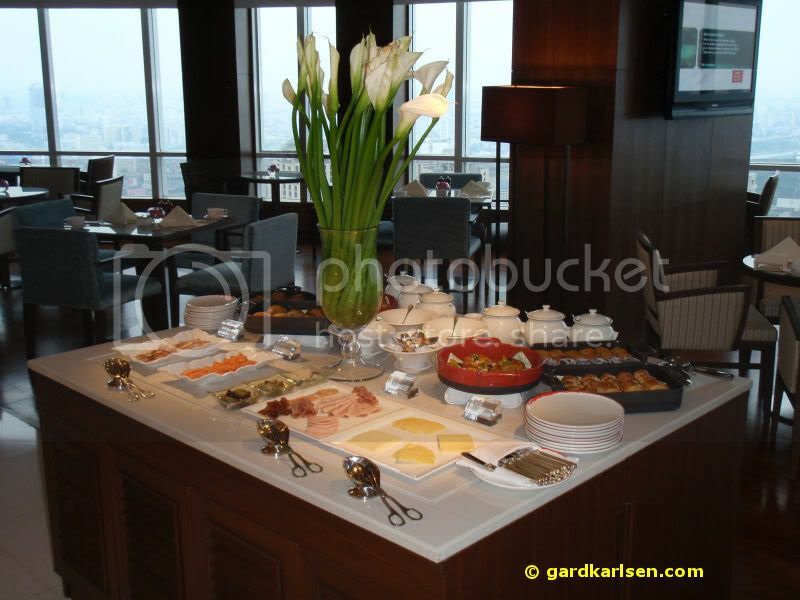 There are two breakfast areas: at the 23rd floor or the lounge on 51st floor for the ones staying at the executive levels. I stayed at the hotel right after the demonstrators had closed down the airport for some time so maybe this influenced the number of guests at the hotel. But I was more or less the only one at breakfast. The breakfast was quite good with a selection of all that things you would expect. But it is not as lavish as the hotel breakfast at e.g. Sheraton. As there were not any other people there I got the staff to help me a bit and I got some explanations on the Asian breakfast – so I got to try congee for the first time – it is sort of a rice porridge with meat in it and you can also add various toppings (pepper, chilli, ginger etc). Anyway, the lounge area is nice and there is an amazing view from the 51st floor. We also went there a couple times during happy hour where they serve evening cocktails from free but once again there were more or less no one else there. 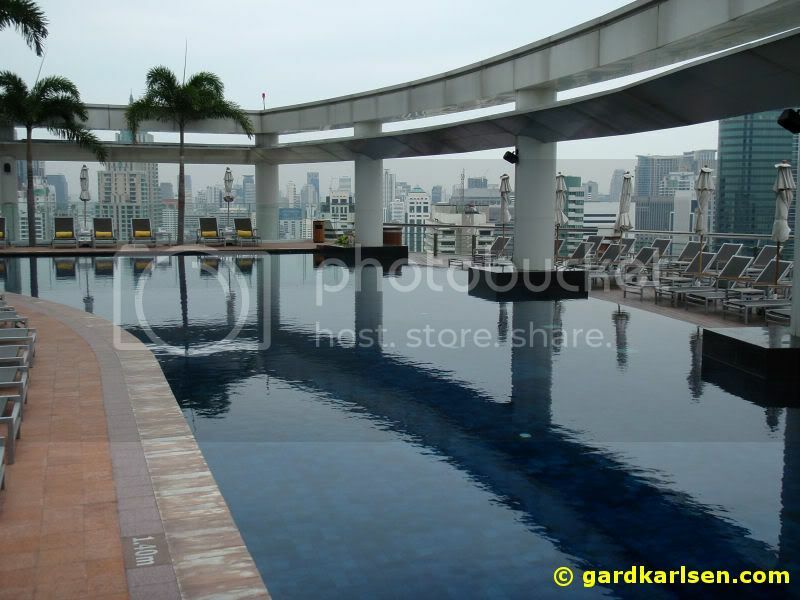 The pool and health club area is located on the 26th floor. The gym seemed modern and had lots of items to be used in a workout and they also had instructors to help the hotel guests. There is also a SPA at this level and even an outdoor SPA garden. The hotel pool was also nice with a small café attached to it in case you want to grab a snack or drink while at the pool. I think it could get quite crowded when the hotel is full but when I stayed there, there were only a couple of other couples at the pool area. In connection with the pool there are also two outdoor tennis courts. The location of the hotel is pretty good. As it is located at the Central World Plaza complex you can basically walk straight into the huge shopping mall straight from the hotel. But it is a bit of a walk if you want to walk to the nearest skytrain station. I think the closest one would be Siam Square and I guess it could take at least 10 minutes. But it is quite cheap to get around in Bangkok as long as you get them to use the meter. The view from the building is of course spectacular as you see most of Bangkok’s skyline. But the area right next to the hotel is filled with small shack and apartment buildings and it is quite a contrast to the modern hotel. At the top of the hotel there is a place called Red Sky – an outdoor bar with a view. I did go up there for a beer and the view was not bad at all. So it could be an alternative to Vertigo on the Banyan Tree building or Skybar on top of Lebua. Centara Grand was a nice hotel when I stayed there – it seemed to be quite new and the style is modern. The room itself was average in size but has a very cool layout. The only problems I had was the hard bed and as usual – the lack of internet. We got the impression that we could use wifi at the lounge but that was not the case as there were no networks available there. For this price I would absolutely say it is a recommended hotel but it is not ideal for getting around as it is a bit of a walk to the skytrain. And it would of course be better with a few more guest – it seems a bit strange to almost be alone at breakfast.